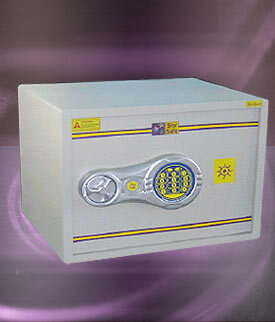 Tristar Enterprises made its presence felt in India in early 2003 and has established itself as one of the reputed organizations engaged in the selling high security electronic safes. In pursuit of perfection, we keep a constant vigil on the quality.  Motorised Opening & Closing.  4-6 digits personal user code for everyday operation.  4-6 digits master code & mechnical overide key for emergency.  Size: 250 x 350 x 250 mm , Weight : 14 Kgs.  4-8 digits personal user code for everyday operation.  4-8 digits master code & mechnical overide key for emergency.  Size: 200 x 400 mm , Weight : 14 Kgs.  4-8 digit personal user code for everyday operation.  Size: 525 x 350 x 350 mm , Weight : 26 Kgs.  Size: 275 x 375 x 175 mm , Weight : 14 Kgs.  CASH DROP from outside.  Size: 300 x 375 x 3000 mm , Weight : 19 Kgs.